Powell Leather is the first choice for Army photo albums, Air Force photo albums, Coast Guard photo albums, Marine photo albums, and Navy photo albums. 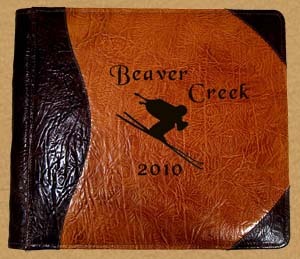 We can craft a custom leather photo album for you personalized with whatever art that you like on the cover leather. We employ several techniques to achieve whatever look you may have in mind for your cover art, please give us a call to discuss which would be best suited for you. All of our leather photo portfolios are crafted from the highest quality materials available, and in the colors and leather of your choice. We offer 12 x 12 photo albums, leather military scrapbooks, 8.5 x 11 photo albums, as well as a variety of other sizes and styles. Please feel free to contact us anytime to discuss how we may craft a beautiful personalized leather photo album for you. 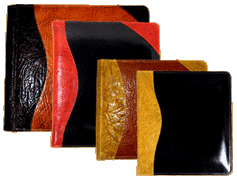 You may browse our website to view our other great products like leather photo envelopes, leather presentation portfolios, leather guest books, and leather wine totes. If you're still searching for gifts for those on your Christmas List, we'd be glad to personalize any of our great products to help you create the perfect gift. We can custom build any leather photo album, leather photography portfolio, leather photo envelope, leather wine tote, or leather guest book to satisfy anyone on your gift list this Holiday Season! Any of our custom leather products may be personalized in any way that you like. A personalized guest book is a gift that will be remembered by friends on your list. 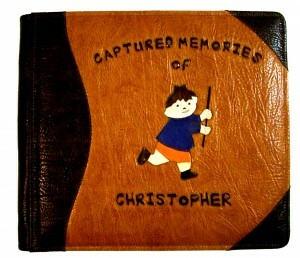 We can inlay any name or logo in leather on the book's cover, and can create personalized guest pages to go inside. Photo pages may be integrated among the guest pages to add faces to the names contained within a photo guest book. Our beautiful leather photo albums may be personalized in the same way. Give the wine enthusiast on your list one of our personalized leather wine tote's that will give years and years of faithful service. For whoever it is on your list, we'll be glad to help you create the perfect personalized gift to make this Christmas one to remember! Preserve your memories of your precious little one with a beautiful photo album from Powell Leather. We can craft an album personalized with your baby’s name, birth date, and any art that you may choose on the cover. Your album may include photos from ultrasound (baby’s fist photo) to important moments throughout life. If you’d like to journal in the album, lined pages may be integrated into the album to document your baby’s journey. Pages may be added to continue documenting memories of baby’s busy days. Integrate lined pages for mom to journal, documenting baby’s journey to life.